Whenever I am in the grocery store I always see the variety of fresh herbs and think wow I would love to buy those. Well, I never do because I feel like the herbs will go bad before I am actually able to use the full amount in the package. I have previously stated that I enjoy cooking, I find it relaxing, so I really like trying new recipes in the kitchen. I recently discovered a way to be able to use a household staple, coconut oil, and fresh herbs for some of my favorite cooking dishes. 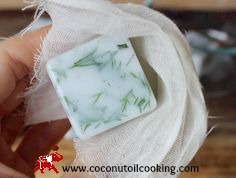 The idea is to combine the coconut oil and fresh herbs by freezing them together to use at a later date. Not only does this preserve the fresh herbs but you’re also using a healthy, unrefined and organic coconut oil in your dishes which really helps to bring out the flavors of your food. I found that the preparation of these coconut oil and herb drops was very easy and took little time! 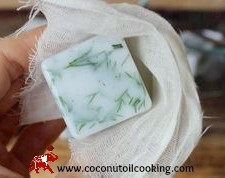 Place your ice cube tray in front of your and put desired herb flavors into each tray. Fill each tray with coconut oil, about ½ to ¾ of the way full. Place ice cube tray in freezer for about 20 minutes. Remove tray from freezer and pop cubes out. Immediately place frozen cubes into an airtight container, with a lid, and place in the fridge. When I first came across this recipe of sorts, I thought that they herb drops would need to be kept in the freezer until use however this is not the case. You will only need to initially freeze them and then keep in fridge to prevent freezer burn. Try using these frozen drops when making Rosemary Chicken or my Ground Turkey and Three Cheese Spaghetti Squash Casserole. These drops would also be great for when you are feeling under the weather and a hot cup of tea would help in soothing your throat. Just add a frozen drop with coconut oil and rosemary or mint and you’ve got some delicious flavored tea, with great health benefits!